Bounty killers led by Loco prey on outlaws hiding out in the snowbound Nevada mountains. After Pauline's husband becomes Loco's latest victim, she hires a gunman for revenge; Silence, mute since his throat was cut as a child. This is Sergio Corbucci's masterpiece. A story of revenge, with an ending so "un-hollywood" it will remain in your memory for ever. And it may be unjust, and leave a very bitter taste. But it is a classic finale to a fantastic film. The story sets itself in the aptly snow laden town of Snow Hill, and its mountainous surroundings. Bounty Hunters are preying off of the outlaws held up within the mountains - the most notorious of which is Loco, played by Klaus Kinski. The wife of one of the slain outlaws hires the mysterious mute gunslinger Silence (Jean-Louis Trintignant) to exact revenge on Loco. I will spoil the story no more - as you MUST see this one for yourself. Kinski, always adept in the part of a mad-man, steals the show in probably his most perfect spaghetti western role. There are also fine parts for spaghetti stalwarts Luigi Pistilli, Mario Brega and Frank Wolff. Morricone's score is, as ever, beautiful. Trintignant must have had one of the easiest parts of any actors anywhere - "just look cool, and don't say a thing". That said, he does it well. The film makes use of its flashbacks with style, explaining the link between Silence and Pollicut (Pistilli) characters. It also deals with the brief and doomed relationship between Silence and the outlaw's widow with great compassion, amidst the bloodbath that we come to expect from Corbucci. All in all, a classic film - and the best non-Leone Spaghetti Western. 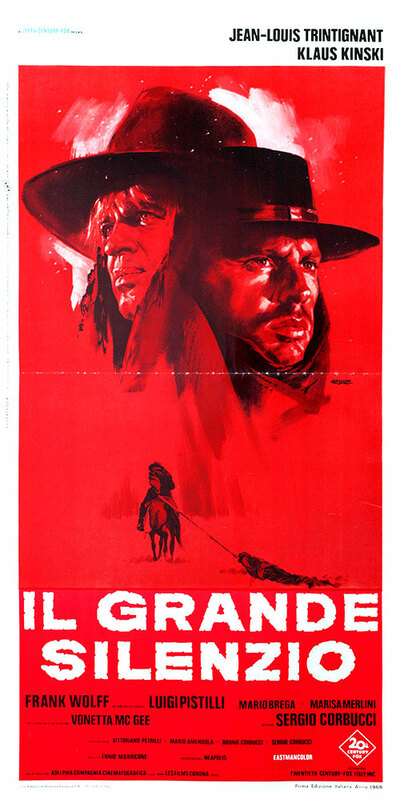 1 Response to "The Great Silence (1968) Sergio Corbucci"
Thanks for this high quality.